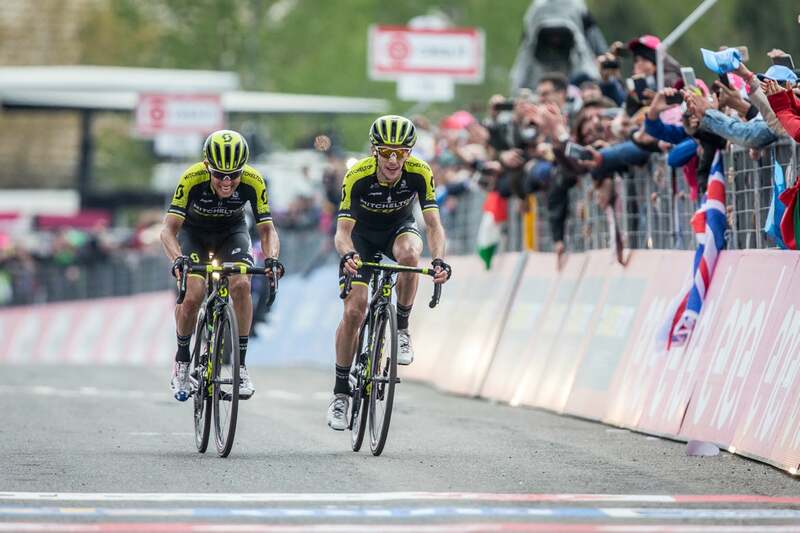 GUALDO TADINO, Italy (VN) — Esteban Chaves must forget about winning the Giro d’Italia or even a podium place alongside his Mitchelton-Scott teammate and race leader Simon Yates. In the wet and cold central regions of Italy, he lost touch with the leaders and slid from second to 39th overall. The Colombian enjoyed the rest day with Yates Monday in Pescara. The first climb on stage 10 the next day, around 20 kilometers from the start in the Abruzzo region, was anything but restful. The small climber — second overall in the 2016 Giro — was dropped by the speeding peloton. Despite a hard chase with three teammates, he slipped away. Chaves finished 25 minutes back at the end of the 244-kilometer stage. “That’s the Giro,” Chaves said at the team bus in Umbria’s Gualdo Tadino, encircled by microphones and television cameras. Instead of Chaves, 2017 Giro victor Tom Dumoulin (Sunweb) now sits second behind Yates at 41 seconds. The fall came hard and fast for Chaves, who won the Mount Etna stage last week in Sicily. Yates took the lead that day and the team steamrolled into the weekend where Yates won the Gran Sasso stage and Chaves placed third. “He’s going to be disappointed, his general classification has gone out of the window,” the team’s sports director Matt White said. Three teammates rode at Chaves’s side and he had the help of team Quick-Step Floors working for Viviani. The gap to the group with Yates almost reached one minute, but then ballooned beyond recovery. Chaves knew the road well. On the rest day, he and White drove the first 100 kilometers to analyze it because they considered it important. And since many teams knew that it would be a fast start, they were on turbo trainers in the start town of Penne. The team now turns all of its focus on Yates, who has already placed seventh overall in the 2017 Tour de France and sixth in the 2016 Vuelta a España. “I think it becomes harder because we are on the final climbs and before, we had two cards to play,” Yates explained after putting on the pink jersey for a fifth day.